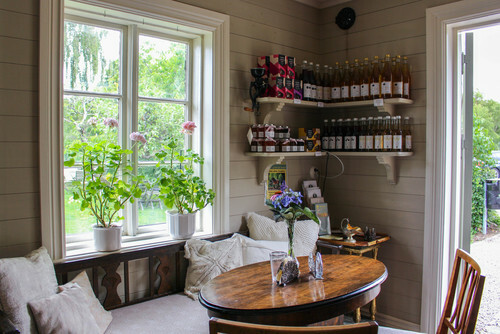 Houzz.se's Matilda Alehke Gunnarsson visits this turn-of-the-century home and bakery in southern Swedish region Halland. It's Friday afternoon, a pleasant late summer day. 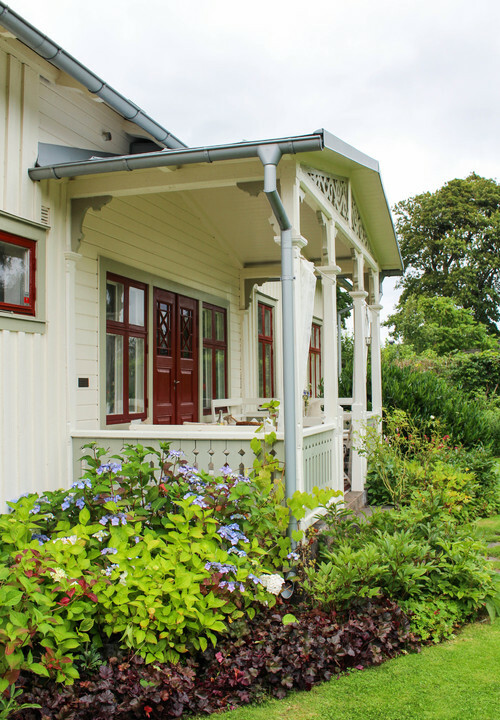 The garden in front of the early 20th century house in Slöinge, a small village 10 kilometres from the west coast and the sea, is filled with people enjoying a Swedish fika, and the queue from the bakery stretches all the way out to the road. This was the perfect summer house, far from the big city and the hectic advertising industry, and also large enough to accommodate visiting family and friends. 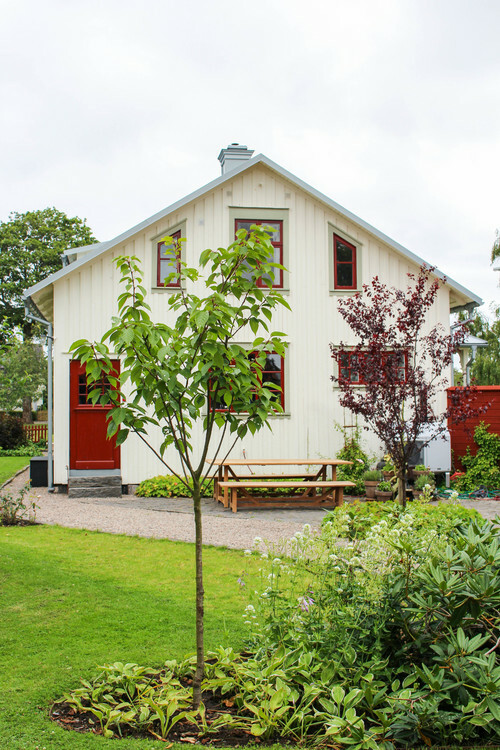 For the first time, Sara and Ante Wennerström agreed, after having viewed more than 50 houses, that they had at last found their rough diamond. 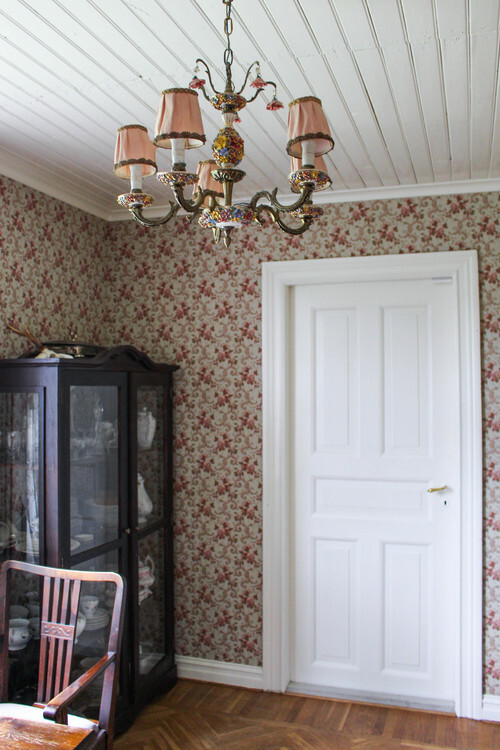 In February 2008, the Wennerströms bought this charming house, back then covered in plastic flooring and renovations non-typical for the era, completely unaware that two years later this would become their permanent home. And not just a home, but also a bakery that attracts guests from all over the country. In 2010, Sara began training to become a craft baker, mainly as a hobby but after the first class she was hooked, and in February 2011 the couple opened Solhaga Stenugnsbageri. Less than five years later, six full-time employees (15 in summer) and long queues of regulars and summer visitors, they have created a fantastic place that combines their home and work. "For me there was something very deep in experiencing beauty around you. It's about creating something that is real, that tells a story. It does not matter if our things are a little chafed, they age gracefully. I like the recycling idea, the fact that we move further away from the wear-and-tear culture," says Sara when she describes the interior of their home. 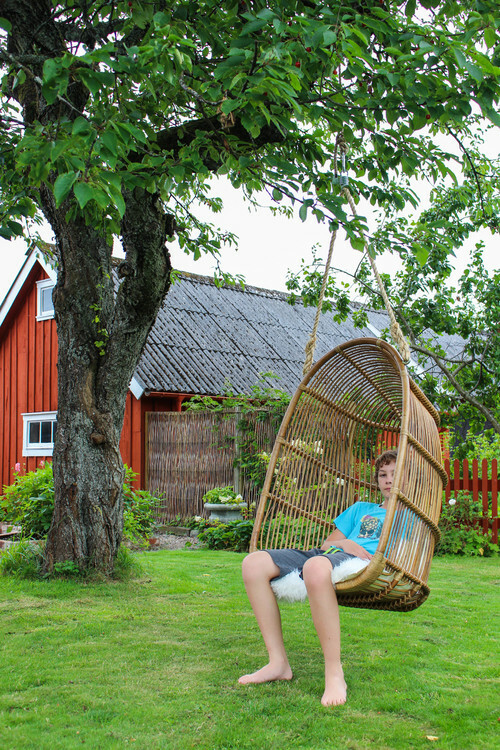 They have come a long way from when the family first drove south from Gothenburg to Slöinge to go on a viewing of the then run-down property. "The porch had no fence and one of the windows in the front was covered with plywood, but that didn’t scare us," says Sara. 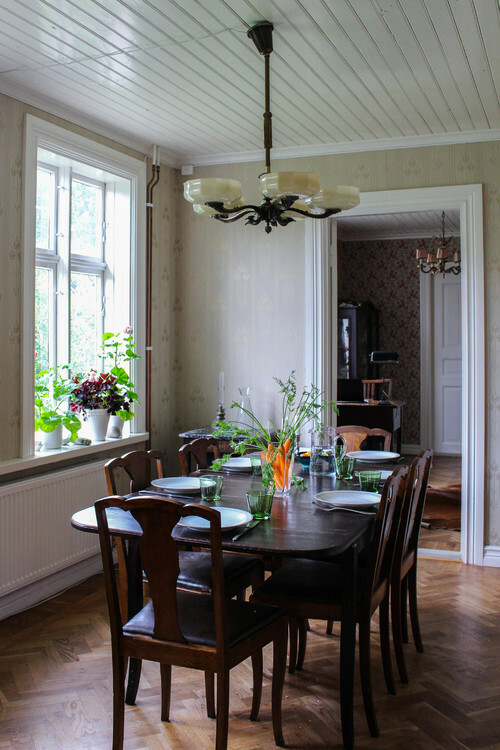 When the family bought the house, a brown plastic fitted carpet hid the parquet floor in the dining room. Now, the old wooden floor is back, polished and oiled. 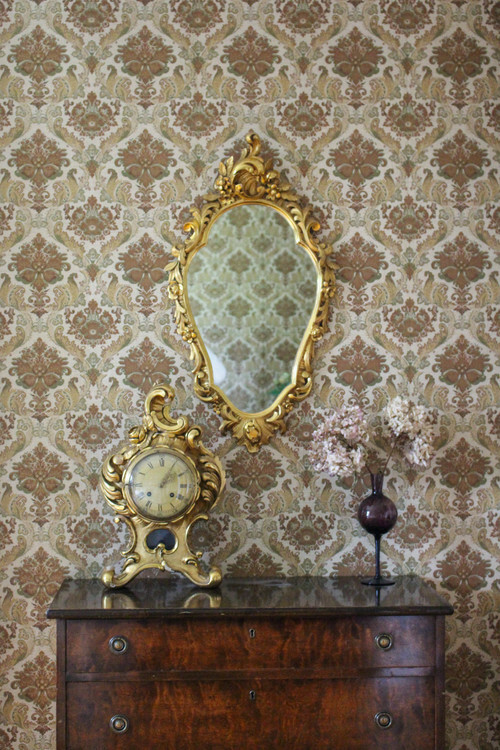 The walls are papered with the golden shimmering wallpaper Jugendros from Lim & Handtryck. "Sometimes I like to think that we are not the ones who choose the wallpaper to the house. It is the house itself that chooses," says Sara. Sara and Ante have been very careful not only to keep the spirit of the era in which the house was built, but also to restore it with the help of skilled craftsmen. 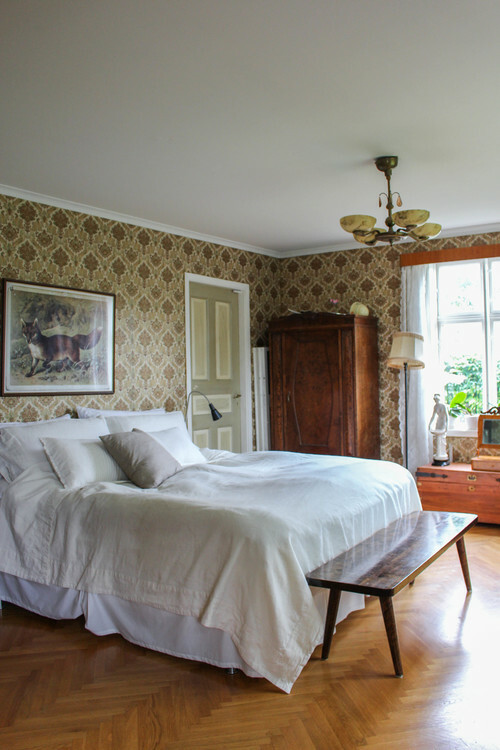 When they bought the property the room above had modern windows from the 60s, wallpaper from the 70s and oak parquet flooring from the 80s. "Today, the house is still a patchwork of different eras, but we try to stay between 1900 and 1950, as the house was built in 1900 and most of the major changes made around that period." The wallpaper in the lounge has an old feel to it but is in fact new. It has two layers; one with brown leaves and another with gold shimmering birds. "This wallpaper taught us an important lesson – don’t hesitate and go for something that is just enough, or discreet. Bold wallpapers are a lot of fun. And don’t put it on just one wall, but in the entire room. Not for one second have I felt tired of this, or experienced that it has become difficult to decorate because we 'stuck' with a pattern or a certain colour scheme. To quote my wise sister who is one of the most stylish people I know; 'You should challenge yourself and your taste,'” says Sara. "We have a summer and a winter bedroom. We usually start sleeping down here at some point in May, it is so quiet and cool here on the ground floor. Then around October time we move up to the first floor and the slightly smaller room with afternoon sun," explains Sara. 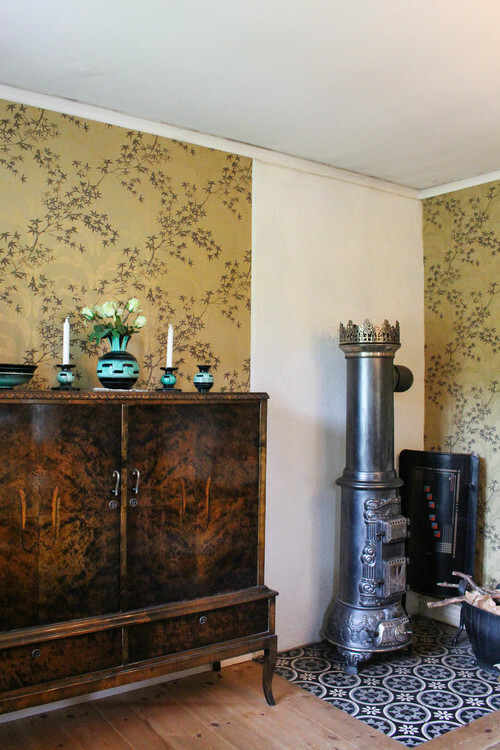 The wallpaper in the summer bedroom is original, probably from the 50s, but in very good condition. The golden mirror and the clock have been handed down from Antes grandmother. "It has been very important for us to create an interior that is consistent with the basics of the house. The house has decided. I think people usually want to implement their own style, which easily makes you forget to listen to the house," says Sara. Going to auctioneers Hebergs Auktioner is one of the family's favourite interests; they sell hundreds of items every third Sunday, all year round. And the white lady above is one of the best finds from there. 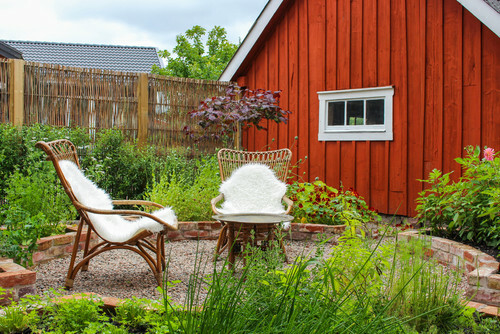 The red wall divides the back of the garden from the front, where the guests enjoy their coffees and fika. Here they grow herbs and berries for the herb-mayonnaise and the cakes. You can get far with a bit of love, care, nutritious composted soil and plenty of water. But it has obviously also required a few hundred plants and bulbs. As with the house, they have carefully restored the garden in a spirit typical for the era. The house, garden and bakery – hand in hand, in hand. Son Max taking a break from the trampoline. Hanging chair, Sika Design. The red little cottage in the garden has plenty of storage space and a laundry room for the employees in one part, and in the part above a peaceful and harmonious conference space to rent to businesses and individuals. When the family bought the house, the kitchen was dark and dreary with yellow pine cabinets. The cabinets above the stove were removed completely. Above is the cooker, Rangemaster. 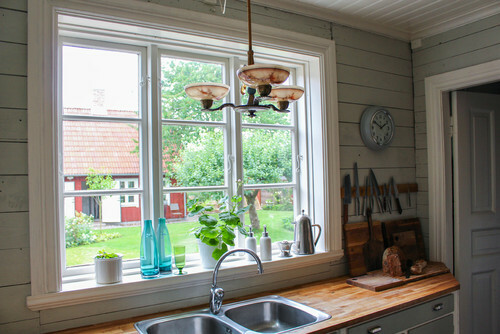 The kitchen window is new, but created in old style and lets in lots of light. From here you look out over the back of the garden. They kept the old kitchen cabinets from the 30s. 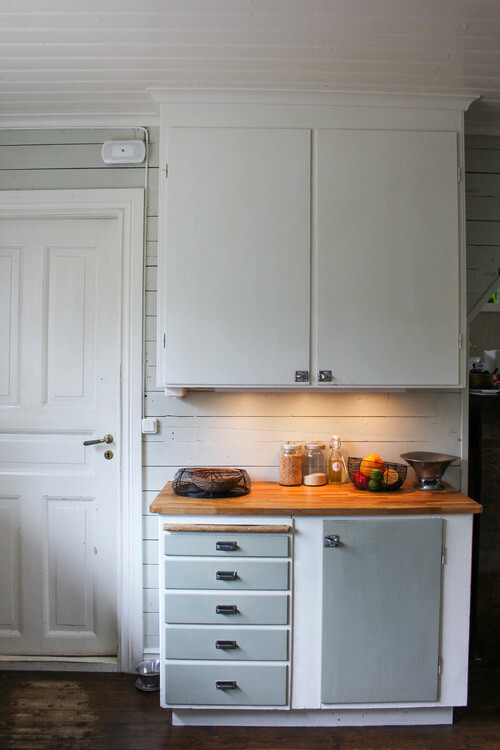 They were put on a base for better working height, and painted in white and a grey-green linseed oil paint from the company Ottossons färgmakeri. A type of colour that meet many of the environmental requirements of products today. 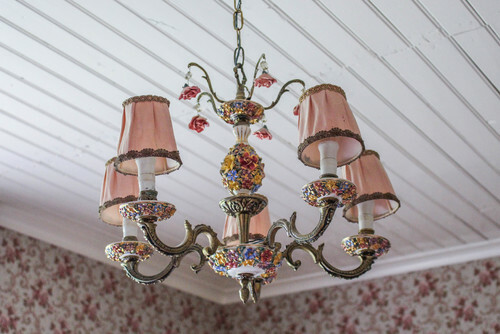 The Rose Room got its name from the lamp and its beautiful small porcelain roses. And the wallpaper was chosen with the name of the room in mind. 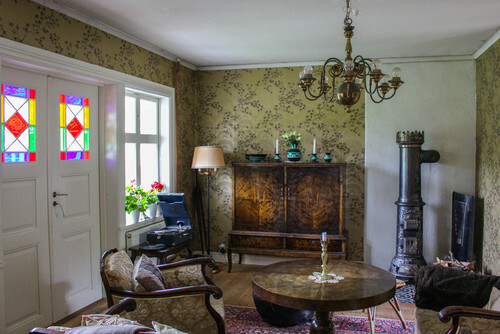 This is where Sara sits and writes all posts for her blog sarabakar.se. 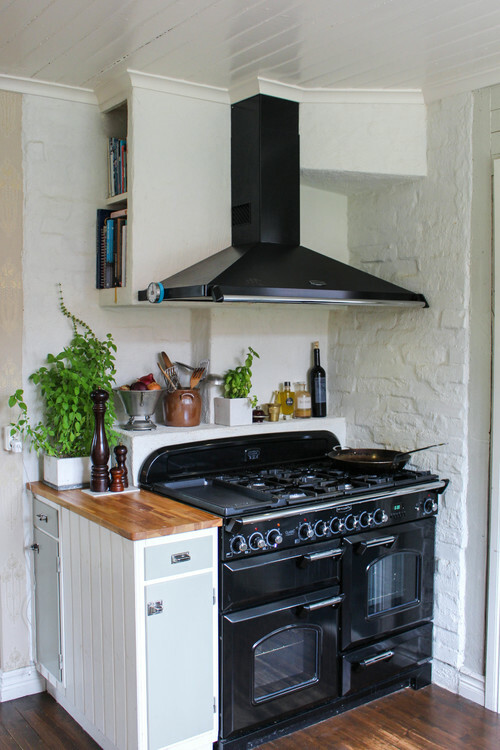 "I started blogging in 2009, around the same time that we bought the house and began renovating the stone oven in the cottage. 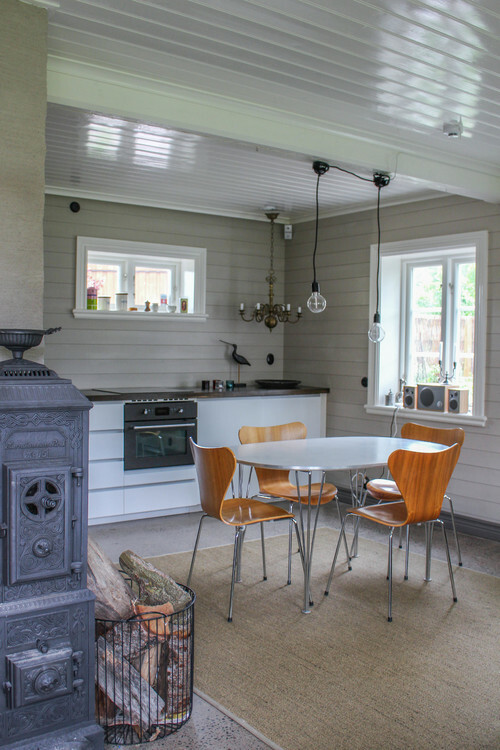 And that is exactly what I blog about – the stone oven, sourdough, and our house Solhaga." 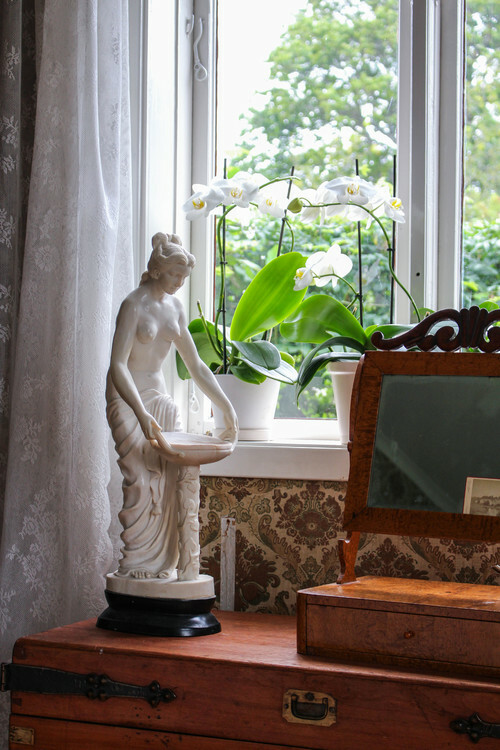 The rose lamp is a bargain from Antikstället in Slöinge. 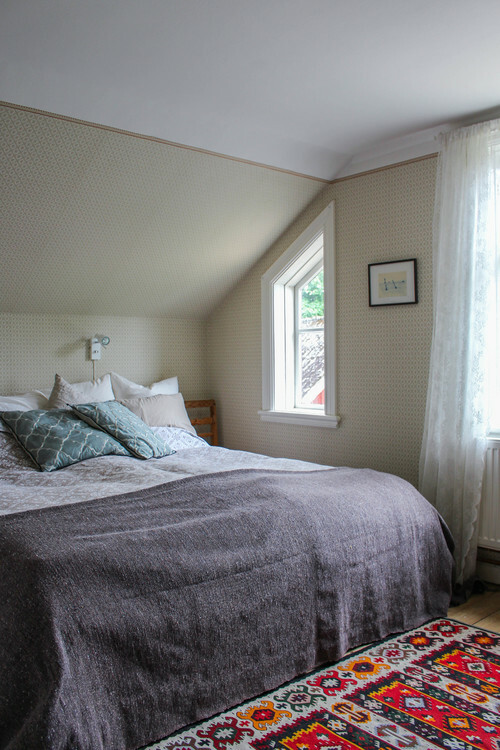 The winter bedroom is located upstairs. Smaller than the summer bedroom, more of a den and decorated in warm earthy tones. Exactly what they and many others prefer during the colder months. Wallpaper Mölletorp, Lim & Handtryck. Throw, Indiska och Marrakesh Design. Pillows, Day. 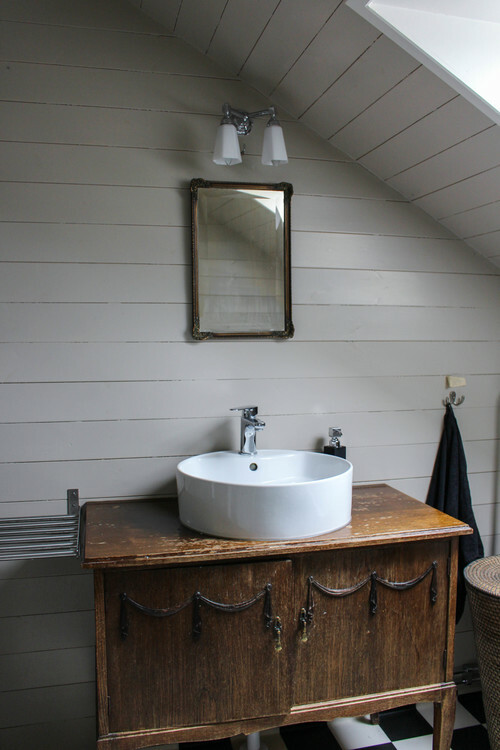 Instead of tiling the bathroom, they covered the walls using horizontal wood panelling, painted with wet room paint. The commode is a charming budget version from Antikstället for 400 kronor, and the round sink on top is from Hafa. "It doesn’t really have to be more complicated than that!" Sara says. The furniture upstairs displays the remaining objects of the family's former minimal big city interior style. "We have always adapted our furnishings for the house we have lived in. 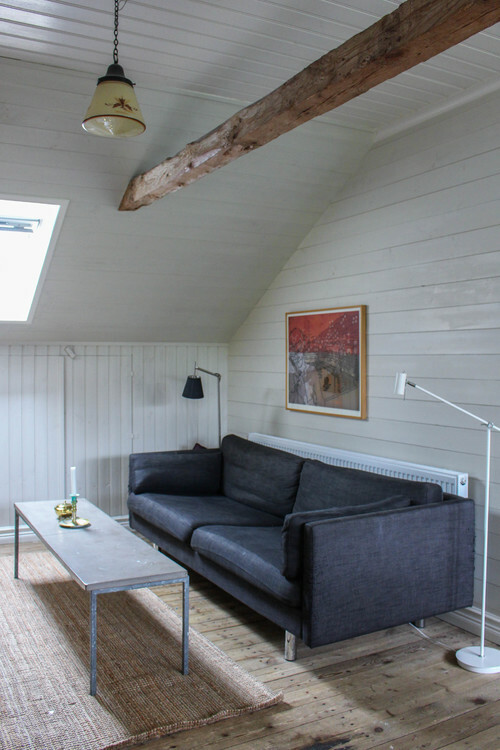 Our apartment in Gothenburg was functional, so it worked very well with a sleek Danish sofa – SL88 by Søren Lund. But a classic is always a classic, so it was obviously allowed to come along to Solhaga!” Sara explains. 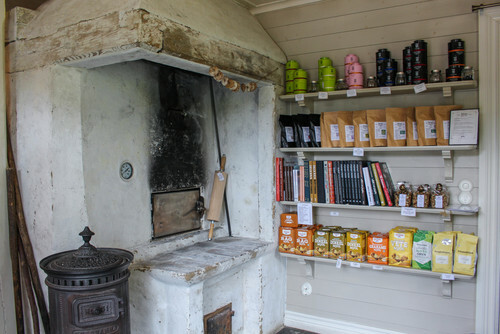 In the centre of the store is the old stone oven – that is where it all began. It is only used on special occasions, everything else is baked in the bakery’s big modern ovens. The croissants and pain au chocolat are made of real butter and on the stove boils the homemade vanilla custard sauce. Everything is made from local products from Ugglarps Grönt and Berte Qvarn. The sandwiches are filled with delicacies from local food companies such as Gudmundsgården, Skrea Ost and Wapnö. The bakery only has two tables indoors, therefore, during the colder times of the year, the regulars normally book a table in advance for their cozy coffee break – just to be on the safe side if you want to get the chance to sit inside on a chilly autumn day. "To work in the garden is one of the best things I know, it's such a nice way of relaxing after many hours of working," Sara says. Around the porch thrive the plants, also a part of the style of the house – hydrangea, heuchera, peonies, roses, bleeding heart, hardy geraniums and lady's mantle. 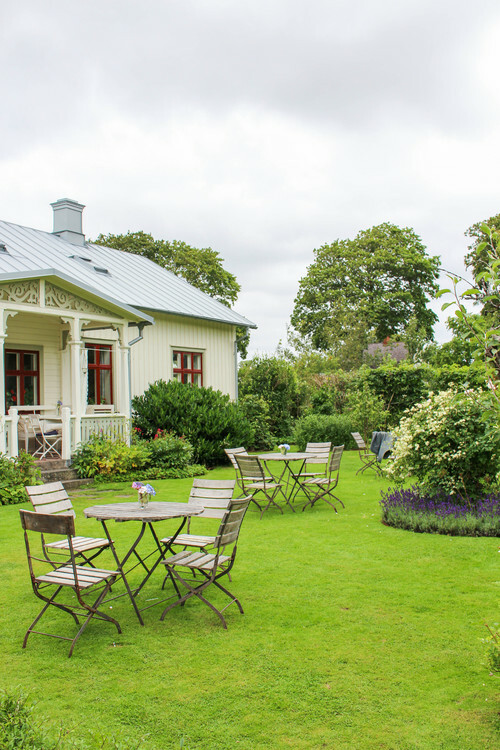 In summer, the lush garden and the veranda are always filled with guests enjoying a fika. 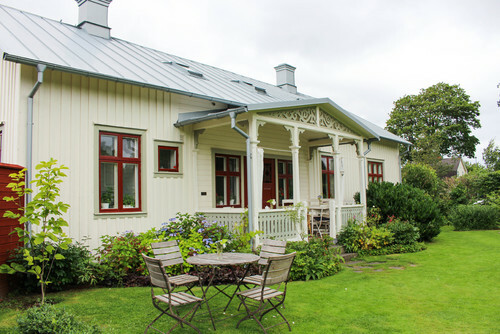 Earlier this year, Sara and Ante were awarded a building conservation diploma from the museum society of Halland, for the extensive and careful renovation of Solhaga. And in the 2015 edition of the Swedish top-food list White Guide Café, Solhaga ended up in 9th place. Perhaps it's time for everyone else to pay a visit to Halland, and not least Slöinge.